Your best choice for the best service. Don't allow termites to further damage your home or property by hesitating to schedule your inspection. SWIFT Termite Control wants to give homeowners a fighting chance with termites. We thought it would be a good idea if homeowners were provided information that would assist them with controlling the ever present termite. As we all know, termites are persistent creatures and can be controlled with the aide of SWIFT Termite Control and a well-informed homeowner. SWIFT Termite Control Company will provide some essential information and a general overview. While much of the termite damage is hidden, termites have few secrets from the professional Inspector. The Inspector knows the conditions termites favor and how to uncover termite activity which the untrained eye might pass over with damaging results. Your first step towards the control of termite infestation is to get a thorough termite inspection and analysis of your home and property. If a complete fumigation is required, you then must prepare to vacate your home. 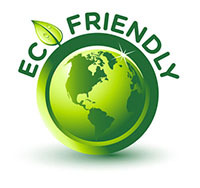 If the property does not require fumigation, there are other methods than can he applied. Methods vary with each house or property. By digging narrow trenches along walls and drilling through surfaces and into voids, chemicals can he applied where they will kill termites within your home and block the colony’s re-entry. Thereby creating an invisible barrier between your home and the termites. This treatment will take a single day or less, with very little disturbance to your daily routine. We truly believe knowledge is power and with the knowledge that you will find on this site, you can ensure professional service from SWIFT Termite Control Company, and will also be able to implement some good preventative measures of your own in assisting with the control of termite infestation in your home. We wish you much luck and if you have not chosen a Termite Inspector for your home or property, please give us a call at 323-295-1220 or email us at john@swifttermitecontrol.com. "Best termite inspectors in Los Angeles. I called two termite inspectors and they inspected and fumigated. I thought I was rid of the termites until a year later, I saw evidence they were still there. I then called SWIFT and they got rid of them once and for all! I highly recommend SWIFT for your termite and pest inspections. They actually know what they are doing!" 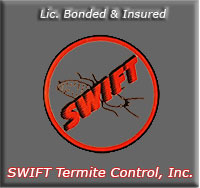 "Thanks SWIFT Termite Control for helping me get the termites out of my home." "Not only do I appreciate SWIFT Termite Control's professional service, I appreciate the knowledge I gained from hiring them. Best Termite Inspectors in L.A. county. You can't go wrong by giving them a call."